Want Pizza? Just Hit That Button on PiePal and Wait | OhGizmo! By Hazel Chua on 11/22/13 • Leave a comment! Pizza is the ultimate comfort food. Failed your finals? Get pizza. Got dumped? Get two pizzas. Got yelled at by your boss? Throw a pizza in his face. Nah, we’re just kidding, because that’s just a waste of good pie. If you crave for pizza frequently, then here’s a bit of good news for you: ordering it just got easier with PiePal. 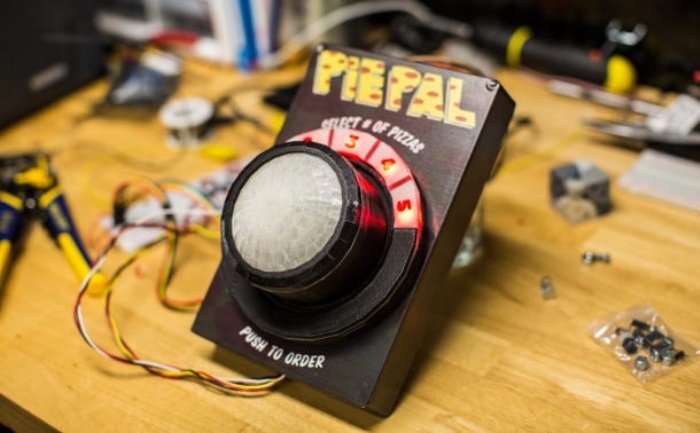 It’s a 3D-printed button that you can hit whenever you feel like getting a pie. All you have to do is turn the dial to indicate how many pies you want delivered and push to order. Developed by iStrategyLabs, PiePal works via WiFi to place your order through Domino’s online ordering system. PiePal is powered by Arduino and Raspberry Pi. There’s currently a call for beta testers, so this would be the perfect gig for you if you love pizza and tech.